PORTLAND, Maine – For the second year in a row, the World Pro Ski Tour will return to Sunday River for the final competition of the season, the Visit Maine Pro Ski Championship on March 30 and 31, 2018. Olympian Nolan Kasper and several other international competitors will compete for the $10,000 cash prize. Entering the championship event, Kasper holds a slim one-point lead over Michael Ankeny for the $5,000 season-long prize. Olympian Nolan Kasper captured the $10,000 prize at the first competition at Waterville Valley Resort in February. 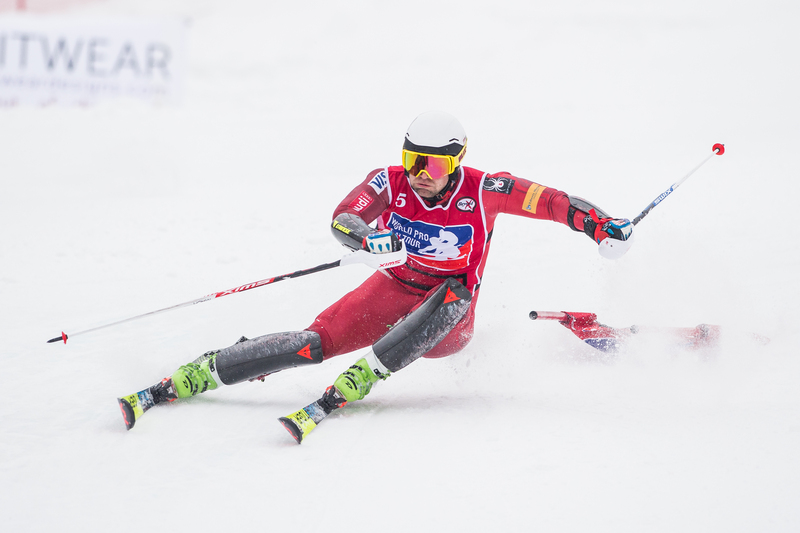 On March 10, AJ Ginnis, a member of the US Ski Team and 2017 US and Canadian National Slalom champion, won the most recent event, the Rocky Mountain Classic at Snowmass, Colorado. The races on March 30 and 31 at Sunday River in Newry, Maine, mark the final event for the World Pro Ski Tour this season. The World Pro Ski Tour is supported by premier sponsors Tito’s Handmade Vodka, Maine Office of Tourism and Greenhead Lobster, along with many other tour partners. The World Pro Ski Tour is an organization dedicated to promoting professional dual alpine ski racing. The tour is lead by the former president of the U.S. Pro Ski Tour, Ed Rogers of Bath, Maine; Craig Marshall of Portland, Maine; Kevin Clarke of Fryeburg, Maine; Barrett Stein of Tamarack, Idaho; and John Jacobs of Glens Falls, New York. The group looks to capitalize on the popularity of the dual format to maintain a full-season tour and offer opportunities for ski racers to earn a living while sharing the excitement of their sport with the public. For more information, visit www.worldproskitour.com.